Lavinia Pallotta (Laurea, It.). Dr Pallotta is part of the editorial staff of "Area 51" magazine in Rome, Italy and an Italian UFO researcher. She writes regularly for a number of Italian UFO magazines. She has conducted interviews with whistleblowers, experiencers and contactees. She also translates UFO/exopolitics literature from English into Italian. 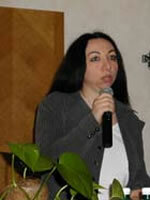 Lavinia Pallota is a member of the Advisory Board of the Exopolitics Institute.